Stock options and child support, self-executing changes in custody/visitation and public policy, ICARA and more. On Friday, Oct. 12, 2108 , the Wisconsin Chapter of the AAML is presenting a fall version of its annual seminar in Madison, Divorce Wisconsin Style. Information is available at the chapter’s website. In addition, this years DCI seminar is called Practically Cooperative and will be held on November 9, 2018 at the Delafield Hotel. For more information, visit the DCI website. This month I discuss Michels v. Lyons, a signficant grandparent visitation case before the Wisconsin Supreme Court. 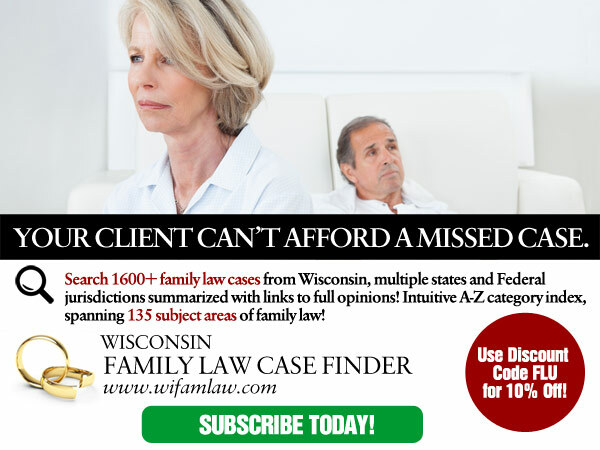 Michels v. Lyons (17AP1142), the grandparent visitation case before the Wisconsin Supreme Court, has now been fully briefed, including five amicus briefs. Unfortunately, no briefs were submitted by either the Family Law Section of the State Bar or the Wisconsin Chapter of the AAML. Watch my video above for my thoughts on the case. The child support guidelines’ definition of gross income is broad, and includes all compensation conferred upon and available to a supporting parent. The guidelines do not exclude amounts that the parent voluntarily defers or refuses to accept. Therefore, once there are no legal restrictions on the employee-parent’s ability to exercise stock options and sell his or her shares, the options must be counted as income for purposes of calculating child support. A self-executing change of custody/visitation is acceptable as long as it poses no conflict with the law’s emphasis on the best interests of the child; however, a self-executing change in custody/visitation that constitutes a material change, or is one that is allowable only upon a determination that it is in the best interests of the child at the time of the change, generally violates Georgia’s public policy founded on the best interests of the child. Trial court abused its discretion in ordering downward deviation of husband’s child support obligation from presumptive guidelines, in divorce judgment, reducing presumptive obligation by $76 per week for period that support would be for two children, where wife did not receive greater value of net marital assets than husband, husband’s domestic partner was contributing to husband’s living expenses, and wife’s earning capacity was very modest at only $14,000 annually while husband earned $335,000 annually. After the father was retired by his employer, the mother moved for modification of a prior child custody order, pursuant to which she had primary physical custody of the child except when the father was home from working overseas. The trial court modified custody to award the father physical custody of the child 59% of the year. The mother appealed. The Supreme Court held that (1) the mother was not denied due process as a result of the trial court’s reliance on grandparent involvement in making its determination on her motion; (2) the trial court abused its discretion by failing to consider, as part of its best interests analysis, that the father intentionally misled the mother about his not going back to work after his employment had been terminated; and (3) the trial court abused its discretion by assigning disproportionate weight to grandparent involvement as a factor in the father’s favor when ruling on the mother’s motion. Under the International Child Abduction Remedies Act (ICARA), a court has limited equitable discretion to determine when to allow an exception to the presumptive award of an attorney fee to a successful petitioner; however, a court must place the substantial burden on the losing respondent of establishing that a fee award is clearly inappropriate. Two considerations that have arisen related to the "clearly inappropriate" inquiry for an award of attorney fees under the International Child Abduction Remedies Act (ICARA) are whether a fee award would impose such a financial hardship that it would significantly impair the respondent’s ability to care for the child and whether a respondent had a good faith belief that her actions in removing or retaining a child were legal or justified. Here, Mother did not remove child in good faith, and therefore attorney fee award under International Child Abduction Remedies Act (ICARA) could not be denied on basis that it was not clearly inappropriate. The plaintiff, Shirley P., brought the present action, seeking the dissolution of her marriage to the defendant, Norman P., after the defendant allegedly sexually assaulted her. While this dissolution action was pending, the defendant was convicted of several criminal offenses arising from the alleged assault. The defendant appealed from the judgment of conviction in that case to the Appellate Court. Thereafter, while the criminal appeal was pending, the dissolution trial commenced. At that trial, the court allowed the plaintiff to present evidence of the criminal conviction. More specifically, the court ruled that the defendant’s conviction had preclusive effect in this dissolution action under the doctrine of collateral estoppel. Consequently, following the trial in the present case, the court concluded, solely on the basis of the evidence of the criminal conviction, that the defendant exclusively was responsible for the marital breakdown. Accordingly, the court entered a property division award that heavily favored the plaintiff. The defendant then filed the present appeal. In this appeal, the defendant claims that, because the judgment of conviction was subject to a pending appeal at the time of the dissolution trial, that judgment was not final. The defendant contends that, therefore, the trial court improperly gave the criminal judgment collateral estoppel effect in the present dissolution action. Subsequently, the Appellate Court reversed the judgment of conviction in the criminal case. HELD: Under the circumstances presented, reversal of the defendant’s criminal conviction strips that judgment of any collateral estoppel effect that it may have had in this dissolution action. Because the fact of the criminal conviction was the sole basis for the property division award, we also conclude that the award must be reversed.